This list of Holiday Movies Streaming on Netflix was updated on 11/06/2017 and will continue to be updated over the next few months. We have several holiday traditions for Christmas, and watching holiday movies together as a family is one of them. We have our favorite holiday movies like A Christmas Story, Prancer, and How the Grinch Stole Christmas. We also like to find new ones and “old” but new to us holiday movies as well. I recently found OVER 80 Holiday Movies Streaming on Netflix right now and I’m sure more will be added! 12 Dates of Christmas: Set up on a blind date with handsome Miles on Christmas Eve, Kate gets 12 chances to relive the date over and over again until she sets things right. 12 Dog Days Till Christmas: When a troubled foster kid discovers the animal shelter where he works is closing, he has 12 days to find homes for all of its unwanted dogs. A Christmas Special: Miraculous: Tales of Ladybug and Cat Noir: Best friends, unaware they are both superheroes, or that one is in love with the other. Crime fighting can be complicated. A Christmas Star: Born under the Christmas star, Noelle says she can perform miracles. When trouble comes to town, it’s up to Noelle to prove herself and save the day. All I Want for Christmas: The only thing that siblings Hallie and Ethan are hoping they get for Christmas is the reconciliation of their divorced parents, and they’re convinced that all it will take is getting Mom and Dad in the same room at the same time. America’s Funniest Home Videos Kids – Holidazed: The joy of the holiday season captured on home video! Angels in the Snow: A bickering couple takes their children on a Christmas vacation and gets a lesson in love and respect after giving shelter to a stranded family. Believe: After his family-run factory falters, jeopardizing his town’s beloved holiday pageant, businessman Matthew faces a crisis of character and faith. Christmas Is Here Again: Santa’s toy sack, packed with gifts for everyone! It’s the greatest thing ever. But not so great? When it goes missing! Christmas Miracles at Sage Creek: Two families struggle without success to overcome prejudice and tragedy in 1888 Wyoming until a special Christmas miracle saves the life of a boy. Christmas Ranch: Sent to her grandmother’s ranch for Christmas, a rebellious teen bonds with her grandma’s horse and resolves to save the ranch from foreclosure. Christmas on Salvation Street: It’ll take a lot of faith to call this place their home. It’ll take even more to leave their mark on the neighborhood. Evergreen Christmas: Choosing between family and fame takes courage. Before you can find what you want, you have to find out who you are. Get Santa: When Santa gets arrested for trespassing after crashing his sleigh, it’s up to a father-son team to spring him from jail and save Christmas. Good Luck Charlie: It’s Christmas: It’s a holiday adventure the Duncans won’t soon forget as Teddy and Amy get separated from the family upon their flight to Palm Springs. In the Land of Magic: When a wicked goblin escapes its cage and threatens to ruin Christmas, it’s up to Santa and his trusty mule, Napo, to save the holiday. Mandie and the Forgotten Christmas: A forbidden attic harboring a hush-hush holiday mystery. For this spirited girl, Christmas may never be the same. Mariah Carey’s Merriest Christmas: Pop music superstar Mariah Carey hosts this all-star holiday celebration with special guests and a celebrity reading of “The Night Before Christmas”. Marvel’s Super Hero Adventures: Frost Fight: In this Christmas-themed special, Captain America and the Avengers battle Loki and Ymir, who plot to steal Santa Claus’ powers and conquer the world. My Dad Scrooge: With the help from some talking farm animals, two kids perform the classic “A Christmas Carol” to awaken the seasonal spirit in their workaholic dad. Pete’s Christmas: An unlucky boy stuck in an endless loop of his holiday nightmare tries to make Christmas count for his family. Pettersson and Findus 2: Christmas is just around the corner, but Pettersson and Findus are worried the snowy weather (and lack of a tree) may keep them from celebrating. Santa Buddies: In this family-friendly North Pole adventure, the rambunctious golden retriever pups known as the Buddies must save Christmas. Santa Pac’s Merry Berry Day: Pac aims to keep Berry Day the happiest day ever by unraveling a curious mystery about his parents and thwarting Betrayus’s plan to capture Santa Pac. Santa Paws 2: The Santa Pups: When Mrs. Claus travels to Pineville, the Santa Pups stow away on her sled. The mischievous little pooches soon begin granting joyful wishes to Pineville’s boys and girls, but something goes terribly wrong: the Christmas spirit begins to disappear. Small Town Santa: Already lacking any holiday spirit on the eve of Christmas, Sheriff Rick Langston sees his world turned upside down after he arrests a home intruder claiming to be Santa Claus. Will Rick find his inner elf with help from a new girl in town? Snow Buddies: When they find themselves stranded in the Alaskan wilderness, the canine offspring of famed sports star Air Bud team up with an experienced sled dog and a husky pup, who teach them the importance of working together. So This Is Christmas: Wayward teen Ashely discovers a fresh direction in her life when a handyman persuades her to organize a holiday pageant for underprivileged kids. The Christmas Project: Four brothers prepare for ware when they’re forced to deliver secret holiday gifts to the school bullies. But they soon learn kindness goes a long way. The Nightmare Before Christmas: Jack Skellington, the spindly king of Halloween Town, kidnaps Santa Claus and plans to deliver ghoulish gifts to children on Christmas morning. The Three Dogateers: When Christmas thieves plunder their owner’s house, three adventurous dogs set out to find the crooks with a little boost from Santa’s holiday magic. Tree Man: Entrepreneurs from Vermont and Quebec sell Christmas trees on the streets of New York, becoming a cherished part of neighborhood holiday traditions. Abominable Christmas: Two small abominable snowmen flee their mountain to escape a scientist who is trying to capture them and end up spending Christmas with a human family. Alpha and Omega The Big Fureeze: A blizzard strands two wolves searching for food, so it’s up to their three pups and their new forest pals to get everyone home in time for Christmas. Bob’s Broken Sleigh: An overly eager elf improves Santa’s sleigh, but when he crash lands far from home, three odd critters pitch in to send him back to the North Pole. Bob’s White Christmas: When piles of snow strand Farmer Pickles at his farm on Christmas Eve, it’s up to Bob and friends to dig him out in time to open presents. Bob the Builder – Snowed Under/The Bobblesberg Winter Games: In this family-friendly adventure, it’s up to Bob and his friends to get everything ready for the Bobblesberg version of the Winter Olympics. Casper’s Haunted Christmas: Casper faces getting into a heap of trouble with the king of the ghosts unless he frightens at least one person before Christmas Day. But how is such a friendly spook supposed to scare somebody during the merriest time of year? Christmas Bunny: A little girl finds a bunny to love…but it’s hurt! Luckily a lady nearby can make everything better. Curious George: A Very Monkey Christmas: George and The Man In The Yellow Hat are having a merry time counting down to Christmas. But neither can decide what to give each other. Will they find the answers before Christmas morning? DreamWorks Happy Holiday from Madagascar: Madagascar goes wild with holiday spirit in this set of Valentine’s Day and Christmas-themed tales featuring everyone’s favorite animal characters. DreamWorks Holiday Classics: Join your DreamWorks friends for these four holiday specials, featuring Shrek and Donkey, Hiccup and Toothless, and the wacky animals from Madagascar. In The Land of Magic: Santa is busy enough at Christmas, now he has to tackle a wicked goblin, too. Good thing his mule’s here to help. Koala Brothers: Outback Christmas: Sad that their friend, Penny, can’t make it to the holiday party, Frank and Buster take an adventure-filled trip to the South Pole to bring her back. Kung Fu Panda: Holiday: As preparations for the Winter Feast build, Po is caught between his obligations as the Dragon Warrior and his family holiday traditions. In the end, he follows his heart and shows both the villagers and the palace the true meaning of community. Magic Snowflake: Young Nicolas agrees to do Santa’s work for one year. But the stress of the job threatens the boy’s sense of joy, and Christmas itself. Mickey’s Magical Christmas: Snowed in at the House of Mickey Mouse: Poor Donald Duck’s got the blues. But lucky for him, ’tis the season for Mickey to cheer him up with a party. Mickey’s Once Upon a Christmas: In three charming holiday tales, Minnie and Mickey recall the year they made great sacrifices for each other; Huey, Dewey and Louie wish Christmas would never end; and Goofy and son Max learn a valuable lesson when Santa visits them. Mickey’s Twice Upon a Christmas: Mickey, Minnie, Goofy and friends celebrate the spirit of the season while Scrooge McDuck humbugs the whole affair in this animated holiday feature. My Little Pony: A Very Minty Christmas: After accidentally breaking the special candy cane which guides Santa Claus to Ponyville, Minty heads to the North Pole to set things right. Power Rangers Samurai – Christmas Together, Friends Forever: On Christmas Eve, as the teens at Shiba House reflect on their first year together, they get an unexpected lesson on the true spirit of the holidays. Power Rangers Super Samurai – Stuck on Christmas: The Power Rangers get stuck in the Megazord’s cockpit on Christmas Eve when it breaks down. Can the Rangers get out in time for Christmas? Power Rangers Mega Force: The Robo Knight Before Christmas: Robo Knight learns the meaning of Christmas from a group children when he is mistaken for a donated Christmas toy and is shipped to a foreign land. Santa’s Apprentice: Young orphan Nicolas learns how to guide a sleigh, slide down chimneys, and other duties he’ll need when he becomes the next Santa Claus. Snowtime: During Winter Break, the village kids split into two groups for an epic snow battle. The conflict heats up, and friends get caught in the crossfire. Stick Man: A stick carried far from his family embarks on an extraordinary journey to get back home for the holidays. The Cat in the Hat Knows A Lot About Christmas: The Cat has a lot of knowledge stuck in his, and it doesn’t stop at the holidays. Ready to save reindeer? The Legend of Frosty the Snowman: The mayor of Evergreen dismisses magic as nonsense, but when Frosty the Snowman blows through town, he shows the local children that magic is real. Thomas & Friends: Merry Christmas Thomas: In a magical holiday special, Thomas looks for the grandest tree on Sodor, while the Logging Locos sing the Snow Song in hopes of a winter wonderland. Thomas & Friends: Santa’s Little Engine: In this Wintry collection, Thomas guides Santa’s sleigh, learns an important lesson snow safety, and gets decked out for the holidays. Thomas & Friends Ultimate Christmas: In this holiday-themed collection, Thomas encounters an avalanche while picking up a Christmas tree, James believes he’s spotted Jack Frost, and more! Thomas & Friends Very Merry Christmas: Unwrap the holiday adventures with Thomas and his friends for a very Thomas Christmas filled with friendship, teamwork, and fun! Thomas & Friends: The Christmas Engines: It’s Christmas time in Sodor, and while Thomas clears the snowy tracks on Connor’s passenger line, Percy brings holiday fun to Reg at the scrapyard. Thomas & Friends Holiday Express: Thomas and friends gear up for adventures involving Christmas trees, snowmen, surprise parties, and a winter wonderland of other surprises! A Christmas Horror Story: This anthology features a quartet of holiday-themed horror tales, including Santa battling zombie elves and demonic Krampus stalking a naughty family. A Christmas Kiss: A handsome stranger’s kiss should make her holiday sparkle. Too bad the kisser is her boss’s beau. A Christmas Kiss II: A handsome billionaire’s surprise kiss under the mistletoe sparks his thoughts of romance, but the working girl he kisses wonders if he’s serious. A Dog Walker’s Christmas Tale: Spoiled 21-year-old Luce Lockhart faces a tough decision when a handsome new friend asks her to help protect a dog park from her wealthy employer. A Russel Peters Christmas: Inspired by the variety shows of the 1970’s, “A Russel Peters Christmas” is a sweet, silly, sentimental, and most of all, funny Christmas special. A Very Murray Christmas: Bill Murray rounds up an all-star cast for an evening of music, comedy, and good cheer in this homage to classic variety shows. All American Christmas Carol: Thanks to her neglect and her drinking, a self-absorbed mother is on the verge of losing her children. Can a trio of ghosts put her on the right path? Back to Christmas: A year after her broken engagement, a young woman awakens to a Christmas do-over but learns the happy ending she wants may not be the ones she needs. Bad Santa: Criminals Willie and Marcus disguise themselves as Santa Claus and an elf and find work at major department stores with plans of robbing them blind. Bad Santa 2: Sad-sack Santa Willie Soke isn’t known for doing the right thing. Now, with the help of his mom, he’s about to take his act to a whole new level of bad. BoJack Horseman Christmas Special: It’s Christmas and BoJack wants nothing to do with it. Then Todd shows up with a giant candy cane and an old “Horsin’ Around” Episode. Christmas Belle: As auctioneer Belle catalogs a hardened millionaire’s collection, their icy relationship starts to thaw – until her longtime suitor comes to visit. Christmas Cracker: It’s more than a slight case of holiday madness for these Christmas-obsessed people, who love to celebrate Yuletide, sometimes all year long. Christmas Crush: Twentysomething Georgie pines for her old boyfriend and is thrilled to have a second chance at love when she attends their high school reunion. Christmas in the City: To make ends meet, a woman takes a job at a city department store. But her grinch of a boss fires the in-house Santa, not knowing he’s the real deal. Christmas in the Smokies: In the Smokey Mountains, an ambitious woman works to save her family’s historic berry farm as her ex, a country music star, returns to town. Christmas Wedding Baby: As she prepares to marry her workaholic fiance, bride-to-be Andrea discovers her wedding-photographer ex-boyfriend was hired to capture the nuptials. Dear Santa: Finding a letter mailed to Santa by a girl asking for a new wife for her daddy, twentysomething Crystal sets out to make the girl’s wishes come true. Gremlins: A man brings home a cute creature as a Christmas present for his son that spawns a horrifying army of devilish and dangerous little beasts. Happy Christmas: After splitting up with her boyfriend just before the holidays, a young woman moves in with her older brother and his family. But as she tries to climb out of her rut and start over, her self-destructive behavior gets in the way. Holiday Baggage: Sarah and Pete have drifted apart from each other and their grown daughters, but a holiday visit may inspire old feelings and second chances. How Sarah Got Her Wings: When a Good Samaritan dies in a pre-Christmas accident, a celestial hitch sends her back to earth as an angel in training to make something right. I Am Santa Claus: Follow five real-bearded professional Santas as they prepare for the holidays and explain their dedication to protecting the jolly man’s reputation. Marry Me for Christmas: A New York career woman who’s tired of her family pressuring her to get married convinces a handsome employee to pose as her fiance for the holidays. Merry Kissmas: Kayla’s engaged to a famous choreographer but is having some doubts, and discontent turns to confusion when she shares a magical kiss with a stranger. My Santa: A cynical single mom who no longer believes in Christmas falls for a handsome mall Santa, not knowing he’s actually the real Santa’s son. NOEL: You don’t find the holiday spirit in money or sadness. It’s in your heart, and it’s the greatest gift of the season. Pee-Wee’s Playhouse Christmas Special: Oprah, Magic Johnson, and Whoopi Goldberg are all invited, and so are you! Welcome to the goofiest holiday party ever! Small Town Santa: Already lacking holiday spirit, Sheriff Rick Langston sees his world turned upside down after he arrests a home intruder claiming to be Santa Claus. The Christmas Candle: A progressive new minister’s arrival in a small village threatens to end an age-old tradition that brings a yuletide miracle to one of the residents. The Fitzgerald Family Christmas: Family rifts crop up and complications ensue when absentee father Jim Fitzgerald — who deserted his wife and seven children two decades earlier — announces his intention to return home for Christmas. The Heart of Christmas: When Austin and Julie’s young son is diagnosed with cancer, they decide to give him one last Christmas – even if it has to be in October. The Perfect Gift: Holiday tensions teach a father what Christmas is all about. When family comes for an unannounced visit, a festive holiday slips into chaos. The Ref: When a thief takes a wealthy couple hostage during a heist gone wrong on Christmas Eve, they drive him crazy with their constant bickering. The Spirit of Christmas: As Christmas approaches, attorney Kate Jordan travels to Vermont to oversee the sale of an inn, where she falls for a handsome but cursed ghost. Trailer Park Boys: Live at the North Pole: Bubble’s plan to spread the true meaning of Christmas is dashed by Julian’s wish to cash in on the holiday and Ricky’s quest to meet the real Santa. Uncle Nick: At his brother’s traditional Christmas Eve party, lecherous, drunken slacker Nick works hard to make the celebration a raucous disaster. White Christmas: Bing Crosby and Danny Kaye play war buddies turned entertainers who fall for two sisters. The boys follow the girls to a resort owned by their former commanding officer, and he’s in danger of losing the place. What are your favorite Holiday Movies Streaming on Netflix? 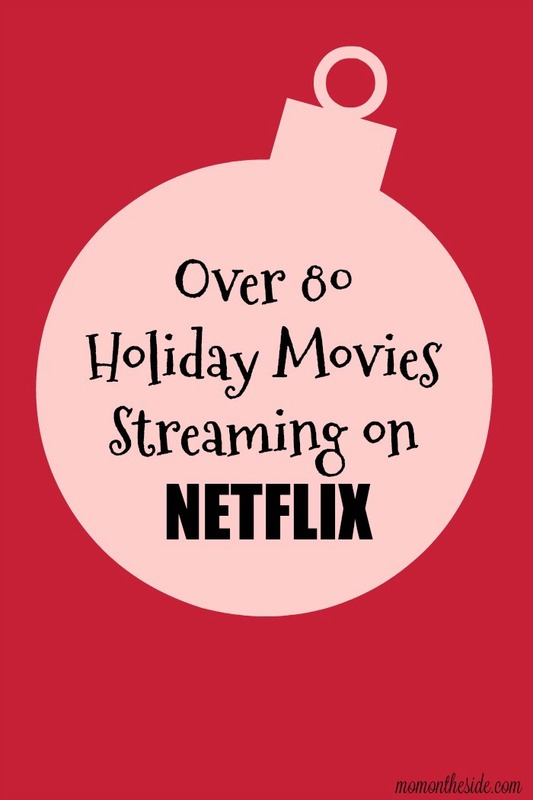 If you are not a Netflix Member yet, you can check them out with a Free Netflix Trial and enjoy some of these holiday movies as well! I would love to watch ALL of these. I LOVE christmas movies. I love this. I am new to Netflix, so still learning. Always in the Christmas mood, so this will be awesome on those days when I need that little extra boost of spirit. Thanks so much for sharing!